Good used condition ~Leather uppers have some scuffs on toes~Bottom outer soles in good condition (Please see all pics) •Inside boot heel to toe measures 11” •Outside boot heel to toe measures 12” •Bottom outer sole width measures 4” •Shaft measures 10” •Contact me with any questions. •Thanks for viewing my listing!! This is a pair of Ariat work boots. They are in good used condition and come from a smoke free home. They do need some cleaning. The size marked is 10.5 EE. The style number is 37127. Please see our pictures and feel free to ask questions. Shipping listed is for the 48 continental US states. Size 10.5 EE. Style 34698. Near Mint Soles and Heels. You Can Never Have Too Many Pairs of Ariat Boots and these are Steal. 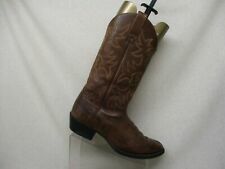 Ariat Mens Size 10.5 EE Brown Leather Western Cowboy Boots Sedona 34625 These boots are pre-owned and do show wear from being worn. In used condition but still lots of life left. These boots have been worn just around the house a couple of times. My mom got them for me but im really not into the cowboy look, so i figured i'd see if i can find someone else who will put them to use. These boots have leather uppers. They look super nice. These are size 10.5 EE in USA. In UK they are size, 9.5 wide.